If any particular aficionados of any particular niche hobbies are worried that their favorite pastime may never receive Hollywood’s famed inspirational underdog treatment, they should probably get in touch with Sean McNamara, a director/producer/writer with Disney Channel ties. McNamara directs everything from Hallmark movies to late-period direct-to-video Baby Geniuses sequels to sitcom episodes to, yes, inspirational underdog sports and sports-adjacent movies, which is to say his range may not be particularly impressive, but his productivity sure is. 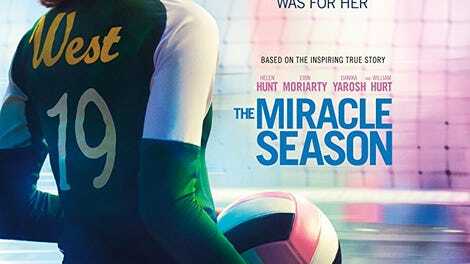 Following his dramas about competitive robot-building, competitive one-armed surfing, and semi-competitive high school performing arts, McNamara’s The Miracle Season is a drama about competitive girls’ volleyball, and how a championship high school team from Iowa worked to rebuild following the loss of their star player. It is, of course, based on a true story. There are not, as yet, many underdog sports movies about volleyball, and the early moments of The Miracle Season make that seem like an oversight. The volleyball team is just the right size for a manageable ensemble, the games are fast-paced and often exciting, and the foley artists have fun with the litany of satisfying thwacks and thunks created by various serves, bumps, sets, and spikes. 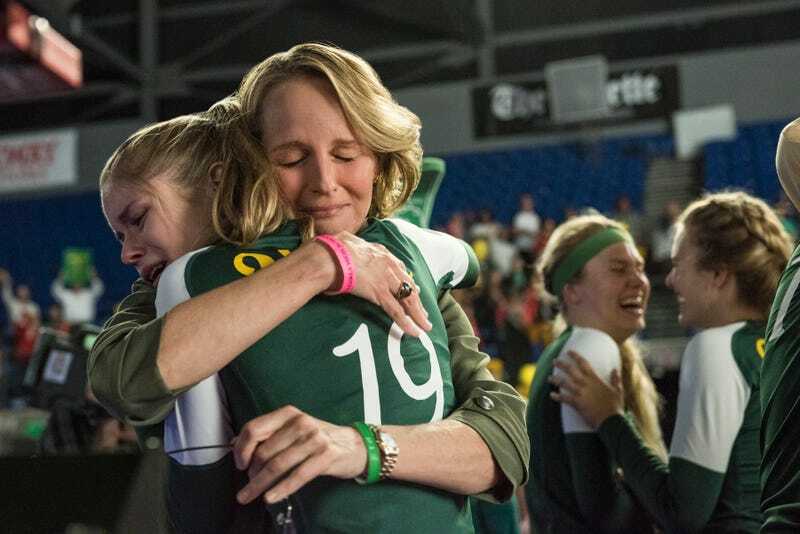 The action has a buzzy pull, at least once McNamara jumps from her inspirational prologue to Caroline “Line” Found (Danika Yarosh) and her bestie, Kelly (Erin Moriarty), prepping for a new volleyball season. A lot of this has to do with Line, a relentless bundle of antic, semi-mugging energy, even when dealing with family health issues. Line is the captain—or “cap’m,” as pronounced by Coach Bresnahan (Helen Hunt)—of the team, and the girls follow her lead. When Line passes away unexpectedly, Kelly, the coach, and the rest of the players (personalities not found) face an uncertain road ahead, torn between the agony of moving forward without their beloved friend and the determination to win games “for Line,” the prepositional phrase that nearly every character in the movie says at least six times. The movie’s central dilemma has some dramatic juice, especially given the way it characterizes the volleyball team: There isn’t a naturally great new player who can help rally an otherwise ragtag group to victory, just the grueling prospect of hard work and lots of practice. This is best embodied by Hunt, who has a heartbreaking scene where she lays out a series of “if only” statements when talking to Kelly about guilt the girl feels over her friend’s untimely death. The Miracle Season’s interest in grief dovetails with its status as a discreetly faith-based entertainment. The film doesn’t wear its churchiness on its sleeve, but as with much contemporary Christian cinema, it takes a lot of dramatic shortcuts, starting with its description of Line as someone who “reached out to everyone”—a wonderful attribute that’s never actually depicted on screen, as this Line seems to reach out mainly to her family and friends. There’s also Line’s grieving father, Ernie (William Hurt, bringing his quiet dignity), who claims he’s been “so angry,” though the only evidence of this is a brief moment where he curtly decides against going to church to deal with his grief. It is not unusual for an underdog sports picture to be predictable. But The Miracle Season seems downright preordained, and not just in its arc. The movie is constitutionally incapable of surprise even on a moment-to-moment level. If characters are talking smack, of course the object of their scorn will turn out to be nearby, within earshot. If characters hesitate slightly before a coin toss, the results won’t go their way. The movie itself feels like a coin toss that always, always, always comes up “heads,” to the point where spending 90 minutes or so in this world constitutes a simulation of psychic abilities. The only real surprise is just how quickly the film is willing to jump to tears, hugs, and swells of music—this happens before the team even gets a winning streak going, let alone makes it into the finals. McNamara seems in a hurry to jerk some tears for the team’s glory and move on to his next batch of underdogs.